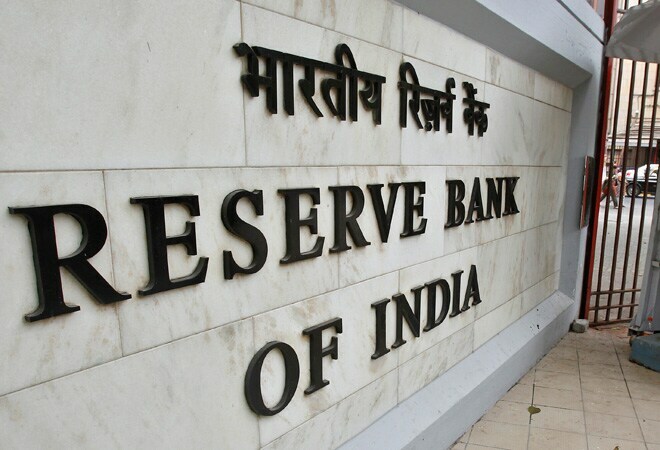 The Reserve Bank of India cut the repo rate, for a third time this year, by 25 basis points (bps) in its policy review on June 2. This is good news for home loan borrowers as this will make room for banks to bring down their lending rates. However, the impact is not going to be very significant. 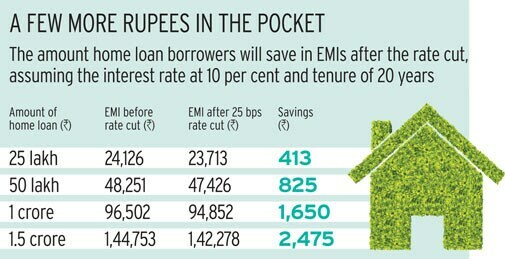 Assuming that banks lower their home loan rates by the same percentage, that is 0.25 per cent, the equated monthly instalments (EMIs) will go down by Rs 823 in case of a home loan of Rs 50 lakh for a tenure of 20 years at a home loan rate of 10 per cent. In case the loan is Rs 1 crore, the amount saved will be Rs 1,650. Banks have been slow in passing on the benefit of lower repo rate to the customers. In total, the RBI has cut the repo rate by 75 basis points this year. But none of the banks has brought down the home loan rates by this magnitude. Banks have reduced their home loan rate by a maximum of 25 to 30 basis points. Had banks passed on the benefit fully to the customers, that is cut the home loan rate by 0.75 per cent, borrowers would have saved at least Rs 2,458 on their EMIs on a home loan of Rs 50 lakh and tenure of 20 years at a home loan rate of 10 per cent. A person would have saved Rs 4,915 on a home loan of Rs 1 crore for a tenure of 20 years. A majority of the end users finance their home purchases through home loans. Cheaper home loans would mean that their overall borrowing cost will go down. Property developers feel lower home loan rates will mean more people buying houses, which in turn will boost their sales. "The rate cut is a positive indication that if macro factors such as inflation sustain, then further rate cuts will follow. This should propel demand significantly," says N.M. Gattu, CFO, DB Realty. The real estate industry, which has been struggling with low sales, high inventories and lack of liquidity, welcomed the move. There is an unsold inventory of around 6.88 lakh units across the National Capital Region, Mumbai Metropolitan Region, Hyderabad, Chennai and Bangalore. Sales were down eight per cent on a year-on-year basis at the end of March. In Delhi-NCR, the situation is worse as sales are down 37 per cent. Lower rates will also help improve liquidity in the market. "This, in turn, would boost the real estate sector as well. The rate cut would help renew interest of end users in housing projects," says R.K. Panpalia, MD, Wave Infratech. Shrikant Paranjape, Chairman, Paranjape Schemes (Construction) Ltd, says the rate cut will help buyers partly offset the higher service tax. He adds that monetary policy will be more effective if the RBI makes the banks transfer the rate cut benefits fully to the borrowers. "The real estate industry expects more rate cuts in the coming months," he says. Long-term debt funds tend to benefit during rate cuts as bond prices appreciate when interest rates fall. In expectation of rate cuts, the yield of the 10-year benchmark bond had fallen from 8.5 per cent in September last year to 7.6 per cent in January this year. The yield went up to 7.9 per cent in June. (Bond prices and yields move in opposite directions.) However, experts feel it's a good opportunity to invest in long-term bond funds. "With the repo rate at 7.25 per cent and possibility of further rate cuts, the 10-year bond yields at 7.85 per cent remains reasonably attractive," says Rahul Goswami, Chief Investment Officer - Fixed Income, ICICI Prudential Asset Management Company. He says long-term funds seem better placed in a downward rate cycle. But for those looking to diversify, a debt portfolio with short- and medium-term bond funds can be a good combination as well. "This is a suitable time to invest in such products with an aim to benefit from the falling interest rates and also limit the re-investment risk." Vikaas Sachdeva, CEO, Edelweiss Asset Management, says existing investors should remain invested into longer-term funds if they can stay for another 12 months as long-term yields are trading at an attractive level over the repo rate. "New investors with an investment horizon of 12 to 18 months can also start investing in long-term income and gilt funds. For a risk-averse investor with an investment horizon of up to six months, short-term income funds offer good opportunity as liquidity is expected to ease going forward, which will be reflected in short-term rates going down," he says.